Design Robb Flynn's Epiphone decal and win a signed Flying V! MusicRadar has joined forces with the friendly-types at Epiphone, as well as our sister magazines Total Guitar and Metal Hammer, to bring you an amazing Robb Flynn competition. 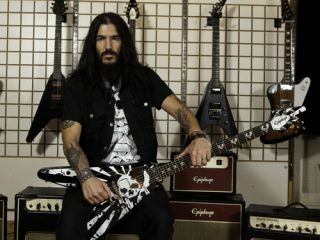 The frontman of Californian metal stalwarts Machine Head has recently teamed up with Epiphone to design a brand new baritone signature guitar, christened the Robb Flynn Love/Death Baritone Flying V.
It's said to be Epiphone's lowest and heaviest guitar ever - a no frills bruising metal machine worthy of its namesake. The Baritone Flying V design is the first of its kind for Epiphone and indeed the entire Gibson family. In celebration of this significant advancement in metal guitar brutality, we're offering one lucky winner the chance to design a decal for Robb Flynn's very own Love/Death Baritone Flying V, which will be presented to him by Epiphone later this year. The winner will have their design featured on one of Robb's own touring guitars and bag an Epiphone Robb Flynn Love/Death Baritone Flying V, signed by the man himself. In addition, three runners-up will also win signed Love/Death Baritone Flying Vs.
To enter the competition just follow the steps below. 1) Pick up a copy of Metal Hammer or Total Guitar magazine and pull-out the Machine Head/Epiphone tear sheet. This will contain the design page, featuring the blank decal template. Alternatively, you can download the template from www.epiphone.com/robbflynncompetition. 2) Sharpen your pencils, chew your crayons and draw your design on the template. 3) Post your design to Epiphone Comp, Future Publishing, 2 Balcombe Street, London NW1 6NW. Alternatively, you can scan your design and upload it to www.futurecomps.co.uk/epiphone. The closing date for competition entries is 12pm BST on Friday 27 July, so make sure we've received your entry by then. The winners will then be announced by Mr Robb Flynn himself on the Epiphone Facebook page on 17 August, as he signs the prize guitars!